Venezuela faces shortages of food, water, medicine, electricity and money. But its state-run oil company -- through a subsidiary -- donated $500,000 to President Trump's inauguration committee on December 22, 2016. 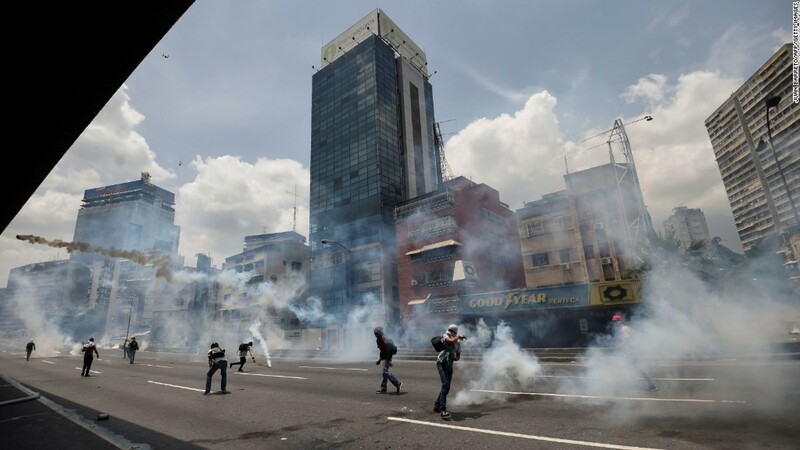 That equals what Pepsi (PEP), Verizon (VZ) and Walmart (WMT) donated combined, according to Federal Election Commission records released Wednesday as deadly protests raged across Venezuela. The donation to Trump's inauguration committee was made by Citgo Petroleum, a subsidiary of Venezuela's state-run oil company, PDVSA. The country's citizens face a litany of crises -- from food and medical shortages to extremely violent crime. "It is an amazing amount of money that could have fed a lot of your population for the month," says Russ Dallen, managing partner of Caracas Capital, an investing firm based in Miami. Venezuela's state-run oil giant, PDVSA, bought Citgo in the 1980s. When the late President Hugo Chavez took power in 1999, Citgo was a huge money maker for the country. Venezuela is home to the world's largest proven oil reserves, which once made PDVSA and Citgo major players in the energy world. During Chavez's presidency, he provided free heating to poor neighborhoods in New York and smaller Caribbean and Central American countries. But with low oil prices and mismanaged resources, the company and country's debts are now piling up as Venezuela runs out of cash. For the rest of this year, Venezuela and PDVSA collectively owe about $6 billion in debt payments. The central bank has only $10 billion in reserves, and much of it isn't even in cash but in gold bars. No wonder, the prospect of Venezuela defaulting on its debt has risen. But like the donation to Trump, the country's leader President Nicolas Maduro's spending priorities are being called into question. So far his government has decided to pay down its debts over feeding its people. The donation to the inauguration has also not helped Maduro earn any favors in the White House. Trump met with the wife of Maduro's jailed political opponent Leopoldo Lopez in the White House in February and tweeted that he should be freed. This past week, the country has been racked by massive protests that were met with force by Venezuelan security forces. At least three people have been killed. "It's very clear he's putting money behind his priorities, but those don't necessarily include the population of the country, in terms of food, medicine, safety," says Eric Farnsworth, vice president at the Council of the Americas. Food imports to Venezuela dropped 50% last year, according to trade statistics. Venezuelans living in extreme poverty lost an average of 21 pounds of weight last year due to lack of food, according to ENCOVI, a polling firm in Venezuela.